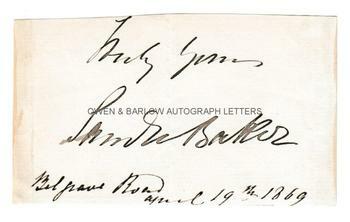 FLORENCE BAKER Autograph Letter Signed & SAMUEL WHITE BAKER Autograph Signature. Florence Baker aka Florenz Barbara Maria Szasz. Hungarian born explorer and Sir Samuel White Baker. English explorer. Co-discoverers of Lake Albert Nyanza. ALS. 2pp. 118 Belgrave Road. 19th April 1864. 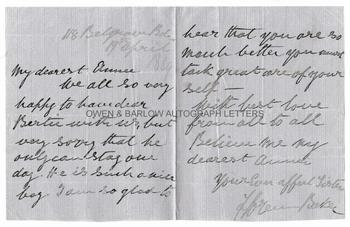 To "My dearest Anna". 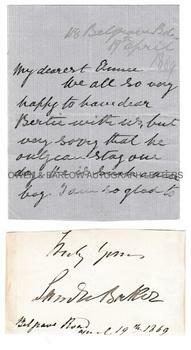 "We all so very happy to have dear Bertie with us, but very sorry that he only can stay one day. He is such a nice boy. I am so glad to hear that you are so much better you must take great care of yourself. With best love from all to all. Believe me my dearest Anna, your ever affect[ionate] sister, Florence Baker." TOGETHER with a paper piece clipped from a letter with the autograph signature of Samuel White Baker and the words "truly yours" and the address and date "Belgrave Road, April 29th 1869". The ALS is 16mo 13 x 11 cms (5.25 x 4.25 inches) in fine condition. The signature piece measures 11 x 6.5 cms (4.25 x 2.5 inches), slight mounting traces to verso, else fine. The background of Florence Baker is shrouded in exotic mystery. She had been sold into slavery and was being groomed for a place in the harem of the Pasha of Vadin. Samuel White Baker was visiting Vadin with Maharaja Duleep Sigh and decided to buy her. Although he was outbid by the Pasha, he stole her away and together they fled to Bucharest. He fell in love with her and they later married. Together in 1861 they undertook an expedition to Africa in search of the source of the River Nile with the intention of meeting up with the East African expedition of Speke and Grant. When they located Speke, he had already traced the source of the Nile and was following its course north into Egypt, so the Bakers changed course and, whilst so engaged they discovered the lake which they named Lake Albert (Lake Albert Nyanza) and the falls on the Victoria Nile, which they named Murchison Falls. They returned to England in 1864. Throughout the dangerous expedition, Florence Baker accompanied her husband and proved every bit as resourceful as him. They returned to Africa in 1869 at the invitation of the Khedive Ismail to lead a military expedition to put down the slave trade. During the fierce fighting, Florence Baker acted as a medic and took part in the battle of Bunyoro with umbrella and pistol in hand! The Khedive appointed Baker Governor General of Equatoria - a position he held for 4 years before being replaced by General Gordon. The couple settled in Devon where General Gordon visited them in 1883 with the request that Baker should return to the Sudan to assist him with the evacuation of Khartoum. Florence Baker was reluctant to return to Africa and Samuel Baker would not travel without her. The Bakers did not, perhaps, receive the same public adulation as some other African explorers of the time, mainly due to Queen Victoria's disapproval of Florence Baker's colourful antecedents. This led her to exclude Baker from Court. The reference in Florence Baker's letter to her sister is a curious one as she is thought to have been an orphan with no family living. It is likely however, that she is here writing to her sister in law, Samuel White Baker's youngest sister, Anna Eliza Bourne, nee Baker. Provenance: From the 19th century album compiled by the family of James Copland F.R.S. (1791-1870), the noted Scottish physician and writer on medicine.